Carefully researched, intimate and devastating by turns, Regarding Muslims analyses the role of Muslims from South Africa’s founding moments to the contemporary period. Gabeba Baderoon will be in discussion with Pumla Gqola, Associate Professor in the Department of African Literature at Wits and the author of What is Slavery to me? Postcolonial/Slave Memory in Post-Apartheid South Africa (2010), Isabel Hofmeyr, Professor of African Literature at Wits and author most recently of Gandhi's Printing Press: Experiments in Slow Reading (2013), and with Sarah Nuttall, Director of WiSER, who will also be chairing the event. Since the colonial period, popular culture has trained a fascinated gaze on Muslims in South Africa. This book argues that the 350-year archive of images documenting Muslims in South Africa is central to understanding the development of concepts of race, sexuality and belonging. Popular culture, visual art, jokes, bodily practices, oral narratives and rich seams of literature reveal the complexity and subtlety of contributions brought to the South African narrative by Muslims, especially in the post-apartheid period. 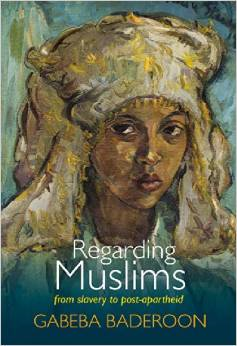 Regarding Muslims also explores how artists and writers have reclaimed and subverted this gaze on South African Muslims, opting for intricacy and open-endedness as alternatives to the themes of extemism and alienation that dominate Western portrayals of Muslims. and an Extraordinary Professor of English at Stellenbosch University. She is the author of the poetry collections The Dream in the Next Body and A hundred silences.